mad orange fools: Finished. Well, kind of. I'm really pleased with the way this turned out. The Pola was blown up to 8x8 and I think it looks super nice framed. 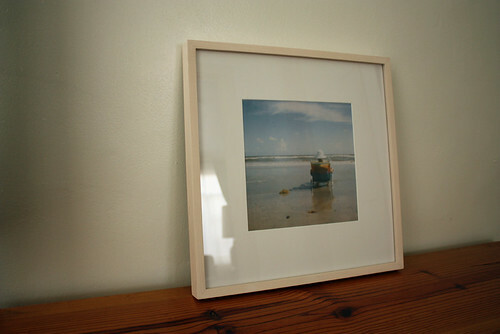 I wish I could have more photos framed, but good lord, it costs an arm and a leg! This piece is a holiday gift for Meg & Shannon, my sister-in-law and husband. 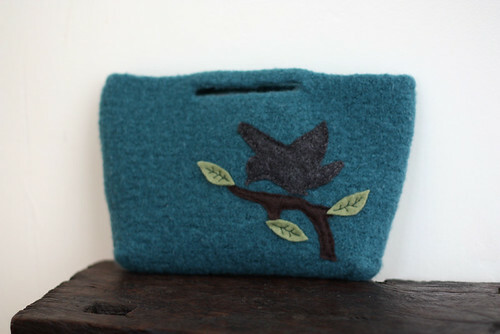 And this is the second felted bag that I mentioned last week. I love it and hope other people do as well! I winged the pattern and it worked out perfectly. I dropped this bag and two others off at a shop this morning so here's hoping that they sell!! I want an excuse to make more. Felting really is a lot of fun. It's been a crazy week, too much to do in too little time and a little bit of overbooking ourselves. I haven't gotten nearly as much knitting done as I had hoped, but it's okay, there's still a few more days to bust it out. All-in-all, things are going pretty well. I've been missing old friends in Pittsburgh recently and got to talk to one of them this afternoon. That was a nice treat. Now if only some of you would come visit us! Southwest has great deals sometimes! Tonight we're having dinner with friends here in town that we haven't seen for awhile and we're looking forward to it. We're going to an Indian restaurant which is pretty exciting because I don't think I've had Indian food since we left Pittsburgh!! Vegetable pakora and matar paneer, here I come. Well, it's back to knitting until dinnertime. A happy weekend to you all. Stay warm! !